Windows Note organizer Note organizer is an advanced program for storing notes, you can create as many sections as you want, sections on html snipets, peoples contact details the possiblitys are endless. Very easy to use and navigate – the is the best way to store notes. Add and remove folders and notes easily! Please not these are free downloads but you still need to purchase the Regkey serial number key for unlocking your software,to finish the install process. All : Windows, including Windows 8, & 8.1 /7,ME,XP, VISTA,2000. Inventory Manager provides manufacturing and operations decision support for inventory management and scheduling with Excel. Maximum 10,000 inventory items capacity. Plus 24 Self Teaching Documents ? Start a Hospitality Business – Start up cost estimator ? financial costs estimator ? 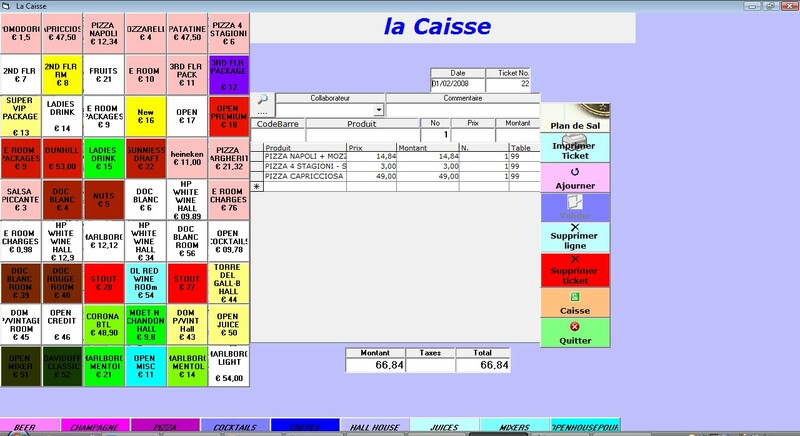 food costs estimator ? market research cost estimator ? financial plan ? skill assessment estimator ? to get you started with a new hospitality business. Determine the best inventory re-order schedules (includes safety stocks), optimize the lowest cost re-order quantities, establish ordering frequencies and lot sizes, receive alerts when you need to re-order, includes seasonality, trends and forecasting, quality control inventory analysis. Improve efficiencies and enhance customer service with INVENTORY MANAGER PRO. You can establish which inventory items should be re-ordered on a daily basis with INVENTORY MANAGER. You can establish least cost ordering quantities with INVENTORY MANAGER taking account of storage costs, administration of purchasing costs and the cost of finance. You can create Excel lists of inventories in categories and storage locations. You can export inventory lists from QuickBooks (and Quattro Pro and barcode readers which interface with Microsoft Excel) to create your own inventory management control system which will include supplier delivery lead time, re-order quantities, safety levels. When you want to evaluate buying inventory in larger quantities to gain volume discounts, use INVENTORY MANAGER to determine the inventory level s for each product item that will deliver profit gains after storage costs are taken into account. Analyze quality control data of incoming stock with INVENTORY MANAGER Statistic spreadsheets. Generate re-order schedules for all stock items. Worked examples and full guidelines provided in a separate demo tutorial version download. 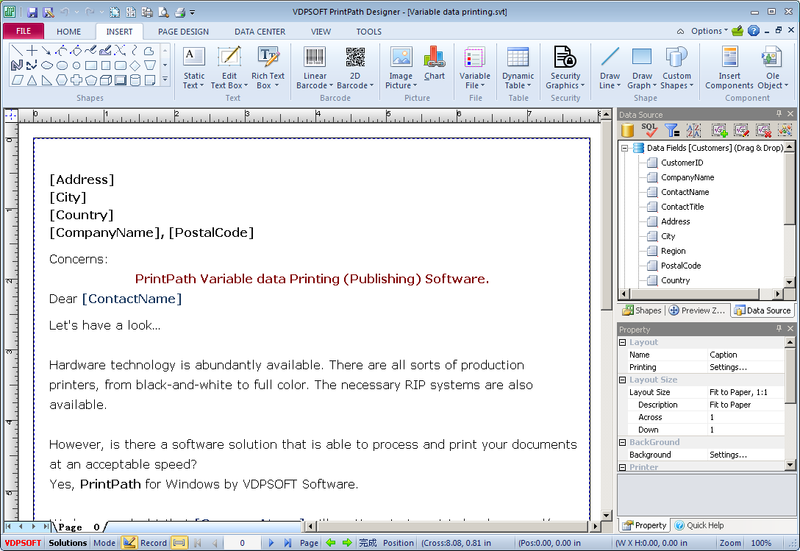 December 14, 2014 Business & Finance, Inventory Systems, SoftwareVDPSOFT INC.
PaperPath variable data printing and publishing software includes all template-design and data-processing features needed by designers. 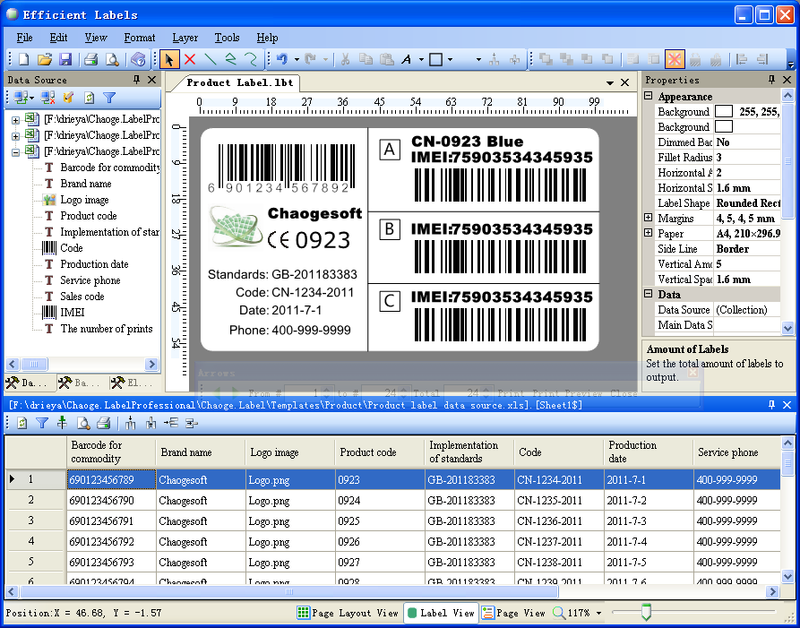 The advanced designer for professional word-processing, barcode and label printing, Includes a complete database support, user and document security and integration options.A wide range of features and options make the it a powerful, but easy-to-use tool for any variable data printing and publishing requirements. Powerful Data Processing and Comprehensive Database Support 1: A user-friendly Database Wizard is available to guide beginners quickly and easily complete database printing. 2: Advanced users can take advantage of a built-in data query builder or write their own SQL commands.In addition to the standard support for text files, excel file, XML files, common database types and ODBC drivers, enterprise databases (Oracle, MS SQL Server, AS/400, Informix, etc.) Powerful Label Designer: 1: PaperPath offers powerful and easy-to-use design tools for creating unique template with rich text, color, images and industry symbols. It has a WYSISWG design window, a drag & drop tool, automatic positioning, unlimited redos and much more to make designing easy. Of course it also has tools for rotating and outlining, thumbnail previews and much more. 2: By using a full-featured set of design Wizards, even beginners are able to create quickly and easily. Any layout can be designed by combining fonts, bar codes, drawing elements and graphics files. Flexible design tools, presented in a user interface that conforms to the latest Windows standards, help users create labels accurately and quickly. Labels can include a wide range of variable fields such as prompted values, serialized fields and date and time stamps. Powerful export support: 1: You can export template as image and web page. 2: Automatic print supported. Efficient Labels is a great label and barcode design and printing application suitable for the layout design and printing of normal stickers, barcode labels (logistics labels), price tags, receipts, documents, tickets, orders, reports, certificates and business cards. It is simple and convenient in operation, efficient in layout design, accurate in positioning and user-friendly in interface design. Features 1. Visual design, precise positioning, perfect matching of design and printing results. 2. Variety of label element changes: scale, move, rotation, symmetric projection and so on. 3. Direct editing of all elements’ properties. You can edit an element’s font, font color, foreground color, background color, and line width, type and color, and can set the element’s border lines. This will make your operations faster. 4. Separation of label’s size specification design and element layout, which leads to a clear and succinct design approach. 5. Various element alignments, alignment of multiple elements and lock of element position. 6. A big variety of label elements: texts, text links (combination of texts), auto texts, lines, polylines, boxes, circles, polygons, pictures and so on. 7. 20+ barcode types; each barcode can be changed freely and can be set at an arbitrary rotation angle. 8. Data import from Excel and Access files, connection to Microsoft SQL Server database, manual addition of data sources and modification and saving of imported data. This will definitely accelerate your work. 9. Saving a design to a variety of common image formats, or you can directly copy and paste it to another application. 10. Shipped with all kinds of templates for users to quickly create an instance. 11. Over 1000 label material for use. 12. Automatic generation of codes, texts and serial numbers. 13. Formatted data output, such as in currency format, exponential format and so on. 14. Supports controlling print numbers directly with a data source. Antamedia Point of Sale software will save you valuable time on key business tasks, cut costs with efficient inventory and customer tracking and show complete business performance at a glance. Easy-to-use point of sale and inventory control system help you track all your sales, customers, vendors, purchase orders and get real time reports and statistics. 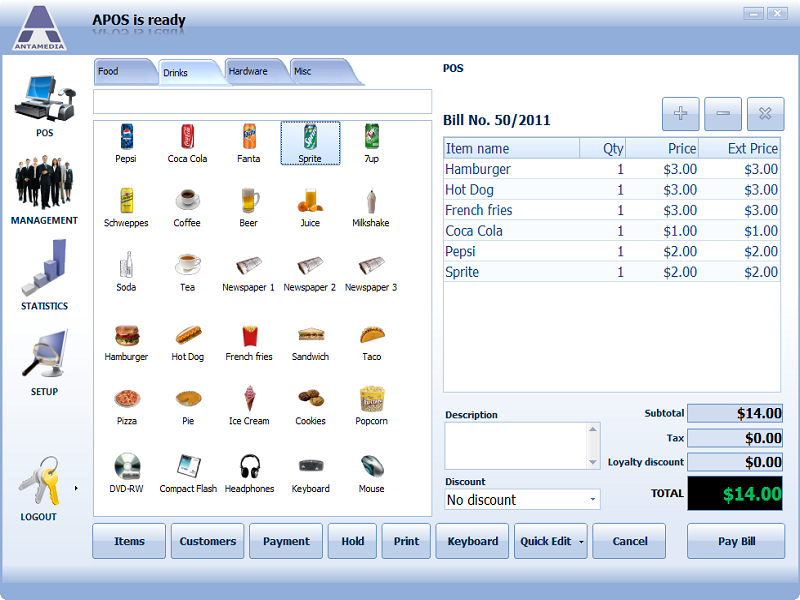 POS items are configured with name, category, retail price or margin, image, minimum quantity on stock Reports and statistics show you top selling products, categories, customers, vendors, employees and loyalty statistic. Customer center stores customer`s detail for identification or billing and delivery purposes Loyalty program emotionally engages customers to use your services, collect points and redeem awards Hold/Unhold helps you hold current finished payment to quickly bill another customer order Easy Quick-Edit-POS Items- increase stock, change minimum stock warning, add new item or category Get notified when item quantity drops below specified amount, so you can order only what you need. Promo pricing & happy hour configuration – offer discounts for desired products to stimulate sales Vendors Accounts help s you create purchase orders for required products, keep track of the bills and payments Quick price changes of the selected products or categories. Put easily last stock items on sale. Virtual keyboard feature helps enter data on a touchscreen. Button size is adjusted for an easy data entry. Caller ID Support finds a customer and the purchase history on a phone ring, so you can greet customer by name.